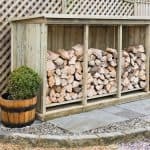 Log stores are highly useful items if you have a log burning fire, stove, or chiminea, but they don’t have to be purely functional. 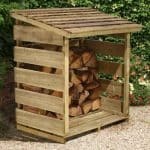 This log store boasts a modern twist on a classic design, and will make a decorative feature for any garden. 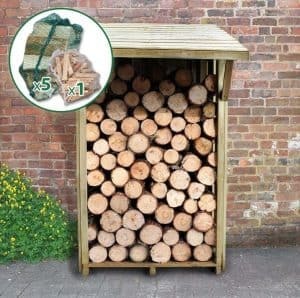 It also boasts very accommodating dimensions, and is in fact one of the tallest log stores that we’ve reviewed. Thanks to its unique flip top design, it’s also very easy to store and retrieve logs. 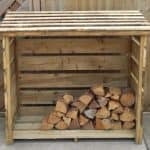 This store features a slatted design, which fulfils a vital function in that it allows fresh air to circulate around the logs.This helps them to dry out thoroughly so that they’re in a perfect condition to use as fuel. The overhanging roof features a pitch, and so even though it has slats it can still help to keep precipitation away from the store’s contents. What we liked most about the timbers used in this log store is that they have all been pressure treated. It means that whatever the weather brings, they will be very resistant to rot. Thanks to this, the manufacturer has been confident enough to provide a 15 year guarantee against rot, which shows just how effective the treatment is. When first seeing this log store it was instantly noticeable how tall it was, but also how elegant and traditional it looks. It features an overhanging pent style roof that is supported by two timber struts on the diagonal. 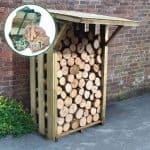 It’s a neat, useful and attractive feature not found on other log stores we’ve reviewed, but what’s best about it is that it can simply be flipped up when storing or retrieving logs from the store. 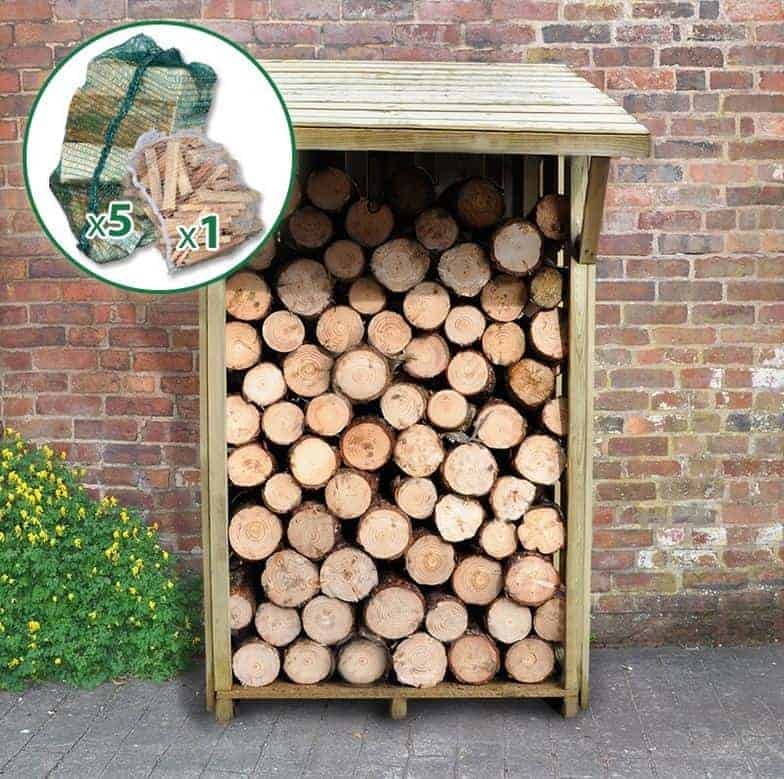 The unusually tall height of this store means that you can store a large number of logs inside, particularly when the depth and width are also relatively generous. This means there’s no need to worry about running out of logs or firewood when you need them most. 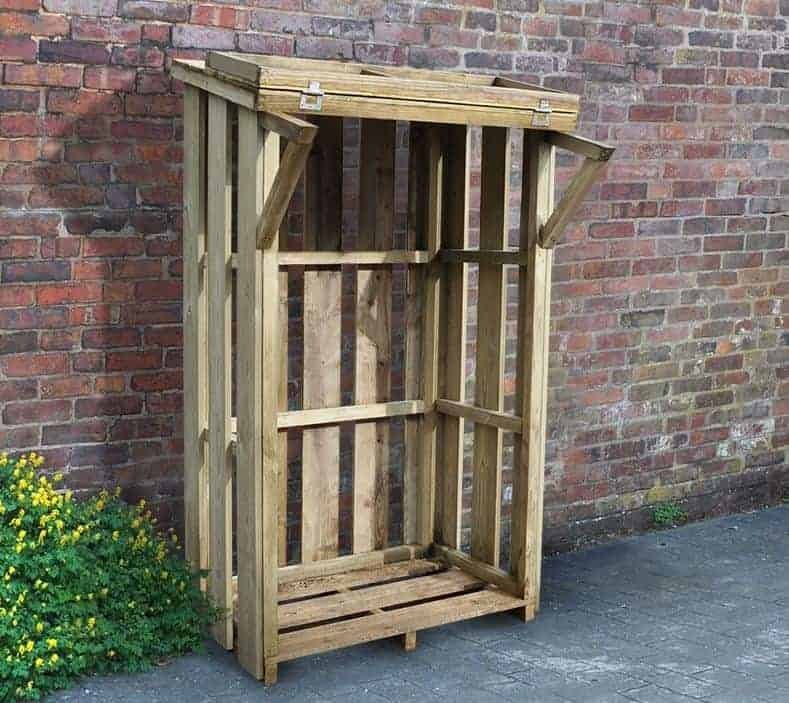 The ridge height, at the back of the store, is 1.91m, well in excess of six foot, and the overall width and depth are 1.15m and 1.17m respectively when the overhang is taken into account. The same type of solid wood cladding is used throughout the store, and assembled in a slatted design. When assembled it feels reassuringly strong and stable. We were pleased to see that the timber is FSC certified as well, as that means that it’s sustainably sourced so that it won’t have a negative impact on your carbon footprint. The floor, like the rest of the structure, is strong and so able to hold the large load of logs that can be stored upon it. It also has three pressure treated floor joists, which is something we always like to see in timber buildings of any kind. By raising the floor above surface level it greatly reduces the risk that would otherwise be posed by ground moisture. Because of the open front and open slatted cladding elsewhere, it can be easy for rain to reach the logs, even though the pitched overhanging roof does a good job in deflecting a lot of precipitation away. 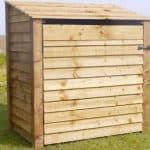 This can be negated somewhat by position the log store in the shadow of a larger structure such as a house or a shed, or by using a cover over the log store at times of bad weather. By using one of these methods to give extra weather protection, the overall durability of the timber store can be further increased. 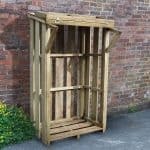 The feature we liked most about this log store is that it has been pressure treated by the manufacturer prior to shipping. This is a very long lasting treatment, and means that the customer gets the reassurance of a 15 year guarantee against rot being in place. It also means that there is no requirement for the customer to treat the store themselves on a yearly basis, although we still feel it’s worth carrying out an annual inspection to see if any more wood preserver is needed. One treatment we do recommend, however, is painting or staining the wood. If this isn’t done, then UV from the sun can quickly fade the wood to a less attractive grey colour. We were pleased to see that so many optional extras are available to buy with the store, and all of them relevant to people with a log burning fire or stove. For example, there is the choice of a log gobbler or log sack which allow for easy transportation of logs to and from the store. There is also a saw horse which holds logs firmly in place so that they can be cropped to the optimal size. The final optional extra available is a weed blocking membrane, which is an ideal accompaniment if the store is to be sited on land that’s been prone to weed infestation. We feel that the flip up roof is a very useful feature, and one that shows the attention to detail and commitment to quality of the manufacturers. Both the integrated floor joists, and the long lasting preservative treatment used on all the timbers, should ensure that this is a very durable log store. We were impressed by how tall this store is, and with a good width and depth as well it’s possible to fit more logs inside than you might initially think. This is so easy to install that one person can do it on their own in around two hours, although an extra pair of hands always comes in handy of course. 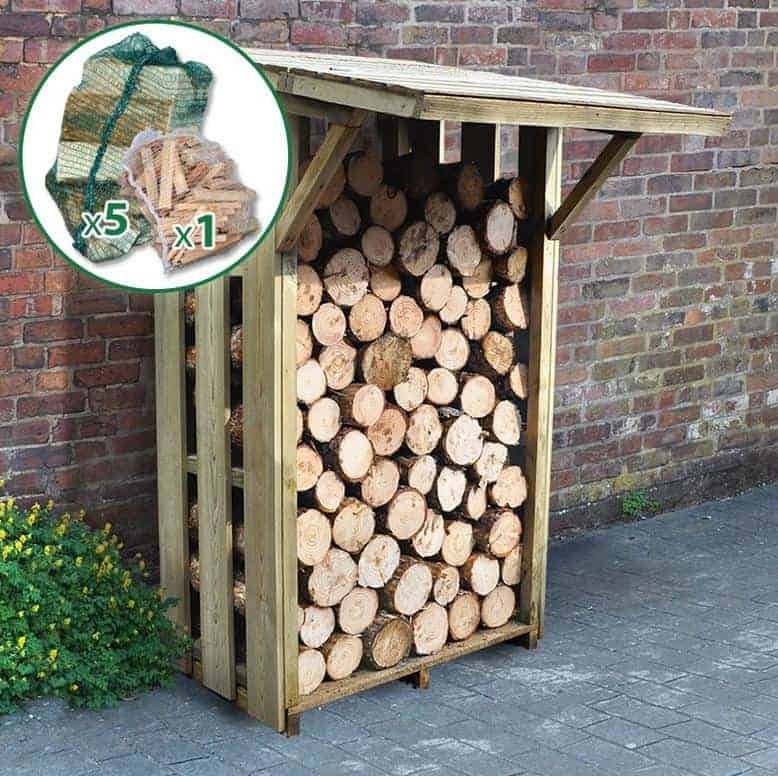 At approaching two hundred pounds, we’ve seen many cheaper log stores, but this does offer a lot of storage capacity and is very durable as well; overall, we feel it represents reasonable value for money. Final Thoughts: We always like to see innovation in things that some people think of as simple structures, such as a log store. That’s exactly what we found here, in the shape of the flip up roof. 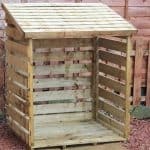 It’s a simple idea but very effective, meaning that extra protection from the elements is offered when it’s down, and it’s very easy to bring logs in or out when it’s up. Another feature we found particularly impressive was the use of pressure treatment to force wood preserver into the heart of the timbers. It means that this store is both tall and accommodating, and very resistant to rot as well.